I dontt know what to do. I'm scared. How did it get there? Who put it there? How did they put it there? What does the writing on its face mean? God, too much is happening too fast...and no one's home, this is the only place I have to turrn too right now...help, someone? Woah, creepy! Maybe one of your family members found it and left it on your bed for you. Who knows why the drew on it. When they get home ask them :) No reason to freak out if there is still a reasonable explanation right? Weird. And yes, I would see if it was anyone you know...maybe someone's idea of a prank? I don't mean to alarm you, but he's got two whole legs now, rather than just the one. I don't suppose seeing the toy again in its entirety has reminded you of anything? I just wondered whether it had jogged any memories about what character Andrew had assigned it. 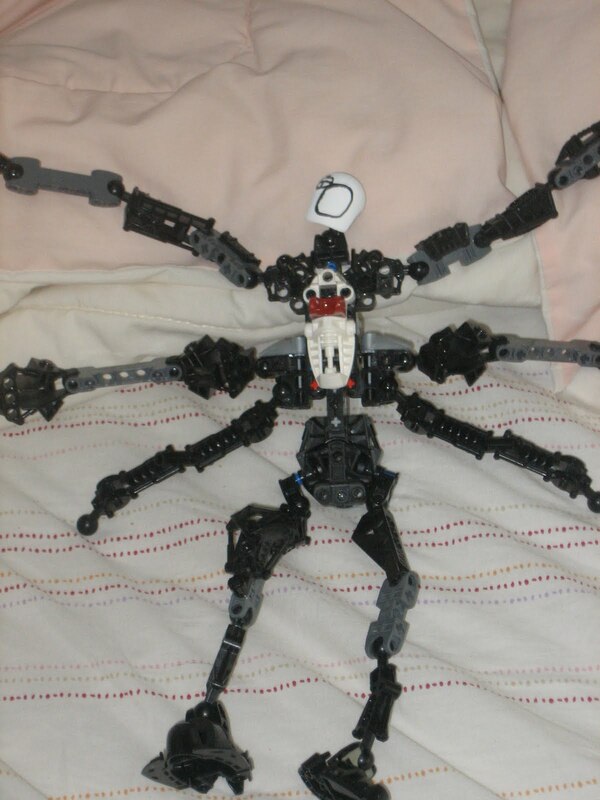 ...are those Bionicle pieces? I used to have some of those when I was, what, six? Hahaha. Anyhow, maybe someone felt like pulling a prank? Or someone wanted to express something, but had limited pieces, maybe it just had some bits and pieces and cobbled them together. Good sir/madam, what happened to the end of your last message? Corruption, or did you hit the keyboard a few times? Hm? This is all really weird... Have the cops found out what caused the fire anyway? Ah, I don't know, I'll have to ask mom. Hold on just a second, I'll put it in my next post.